Ah, zombies. Those undead shits have been around forever, haven’t they? One of the earliest examples of a ‘zombie film’ is Victor Halperin’s White Zombie, released way back in 1932. That’s 85 years ago. In those 85 years, we’ve seen more zombie films than you can shake a brain at, and naturally, in all that time Hollywood was bound to run out of ideas and repeat itself. There are very few examples of a zombie flick that has done something fresh or unique in the last 10 years. In 2014, M.R. Carey wrote a book that aimed to inject some life into this undead genre. 2016 brought the film adaptation. Is it any good? The Girl With All The Gifts takes place in a dystopian future following the total breakdown of society after an infection turned the population into ‘hungries’. 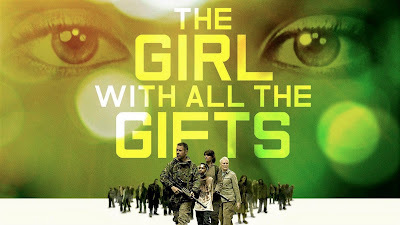 Think 28 Days Later; while these infected creatures aren’t zombies as such, The Girl With All The Gifts bears all the hallmarks of a zombie film. The film opens in a special ‘school’, where a team of scientists experiment on a select group of hybrid zombie children who retain their ability to think and feel, despite a hunger for human flesh. We focus on Melanie (Sennia Nanua), a special young girl who seems to have more of a control over her animalistic hunger than the other children. She must embark on a journey of survival across dangerous land with teacher Helen (Gemma Arterton), scientist Dr. Caldwell (Glenn Close) and the tough Sgt. Parks (Paddy Considine) – will they find the cure, or end humanity once and for all? If Danny Boyle had never given 28 Days Later to the world, The Girl With All The Gifts would be fantastic. But for me, this had too much in common with Days and I found myself comparing the two frequently throughout the 2-hour runtime, which made Gifts feel bad if only by comparison. The similarities go way beyond the infection theme – it’s the whole style; the bleak and depressing post-apocalyptic Britain, the military themes, the travelling. But that’s not to say The Girl With All The Gifts doesn’t have its own merits to discuss. Because it isn’t by any means a bad film. It’s still pretty darn good. Firstly, the film is bleak, dark and violent – something that I sure wasn’t expecting. I was under the impression this was of the Maze Runner and Hunger Games ilk. I thought this was going to be a slightly edgy teen thriller. Nope, The Girl With All The Gifts is a very grown-up and mature piece of work filled with violence, strong language and scares. The film’s colourless and arguably depressing delivery is what elevates it to a higher level – there is some originality in the characters and plot, but neither are particularly engrossing for the most part. The cast are all superb, sure, with Sennia Nanua especially worthy of praise as the young Melanie, a character we don’t know whether to want to protect or run away from. But the narrative itself often takes something of a back seat to the hauntingly beautiful visuals and bleak, quiet delivery. The Girl With All The Gifts might not have the best story you’ve ever seen in a zombie movie, but the style here easily makes the substance worth enduring. This is a surprisingly dark film, and an excellent companion piece for Danny Boyle’s 28 Days Later – provided you don’t expect this to reach the incredible heights Boyle’s iconic film did. I haven’t read the book so could not comment on the faithfulness of this adaptation, but as a standalone piece of work, the Girl With All The Gifts is a visually stunning film and by no means the worst zombie film you’ll ever see. It just isn’t the best, either. The Girl With All The Gifts is a very dark beast, and one that is certainly worth a look if you’re a fan of the genre.